I have been a fan of the reliability and better efficiency of diesels since I was a child. 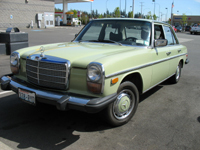 Matter of fact, I'm still driving the car my mother got back then (1976 Mercedes-Benz 240D [w115.117]). I've been driving it since 1986. My wife and I were so impressed by the longevity and reliability of my old car that we bought a newer version off eBay back in 2005 (1993 Mercedes-Benz 300D 2.5L Turbo [w124.128]). Unfortunately, in 2012, after having fixed it all up, a Domino's Pizza driver slammed into it doing about 50mph (our car was stopped), totalling it. But it died well, as my wife only had whiplash, despite the speed of impact. We replaced the '93 with a similar car off Craigslist (1987 Mercedes-Benz 300D Turbo [w124.133] — not in nearly as good condition). We also bought an old convertible we like the styling of (1991 Mercedes-Benz 300SL-24 [r129.061]), which had a dying engine. Since the r129 chassis has a lot in common with the w124 chassis, I am in the process of converting the SL to be a diesel, using the near-perfect condition motor from the wrecked car. We hope to eventually add a hybrid system for local/low-speed driving, perhaps something similar to Dr. Perry's system at MTSU. Active member of the "diesel-benz" discussion list, and former member of the Board of Directors for the Northwest Biodiesel Network.